Star Apartments provides permanent supportive housing to 100 formerly homeless individuals. This LEED for Homes Platinum development subscribes to the housing first philosophy, where each resident is provided with access to primary care, physician, medication, and mental health or addiction treatment as needed. Designed by the award-winning Michael Maltzan Architecture, Star Apartments is a LEED for Homes Platinum development that aims to inspire residents and the surrounding community. The apartments are terraced above a Health and Wellness Center on the second floor, which includes a community kitchen, art rooms, running/walking track, and space for supportive services. Residents can also enjoy a raised community garden, and multiple outdoor patio spaces for exercise and group activities. On the ground floor, the Star houses a clinic operated by the Los Angeles County Department of Health Services (DHS), which serves both Star residents and the surrounding community. It is also headquarters for DHS’ Housing for Health Division, a ground-breaking team that is committed to funneling resources towards the most critical determinant of health: housing. The Star Apartments are part of a larger program called Housing for Health. Since launching, it has housed 3,000 homeless people with a retention rate of 97 percent. “So it’s proven to be very successful,” said Skid Rown Housing Trust CEO Mike Alvidrez. 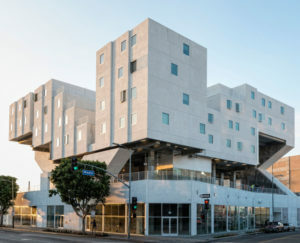 To read KCRW’s piece about the development: A new housing model aims to put a permanent roof over a vulnerable population.